At Symplur, over the past three years we’ve tracked more than 1,800 healthcare conferences from around the globe, and we’ve captured their entire Twitter conversations in our database of health related tweets at the Healthcare Hashtag Project. Sometimes we’re hired to help facilitate the social media experience at these events, and/or to do a deep-dive into the analytics of those conversations. Other times we’re just naturally curious. So we watch, listen, and like all good data geeks … we write algorithms to slice and dice all the wondrous bits of what’s being discussed on social media surrounding these events so that we’re able to uncover and tell the many stories that lie within. I believe it was last April when I stumbled upon a YouTube video of a Google Hangout providing insight into Medicine X via Q&A with patient attendees. It featured Christopher Snider (@iam_spartacus), in the dual role of moderator/ePatient, and a panel that included the organizer of Medicine X, Dr. Larry Chu (@larrychu), and several other ePatients who had attended the conference in 2012. I was riveted to the screen for all 61 minutes of video as I learned how patient centric the conference was. Flash forward several months and Audun (@audvin), one of my Partners at Symplur, and I were thrilled to be packing our bags and heading to Palo Alto to be part of Medicine X! We were going to be able to run our live Twitter analytics package (debuted in Paris at Doctors 2.0 & You) on the two “big-screens” in the main hall during breaks. What’s more, we felt especially honored to be the very first speakers after Dr. Chu’s opening remarks. Specifically, we were asked to begin the conference by sharing our insights into the social media discussion surrounding last year’s event. And with that, we had the perfect opportunity to highlight something that we’ve been fascinated with … how the voice of the patient has been able to move to the forefront of the healthcare discussion on the social web. Part of our presentation included the video below. 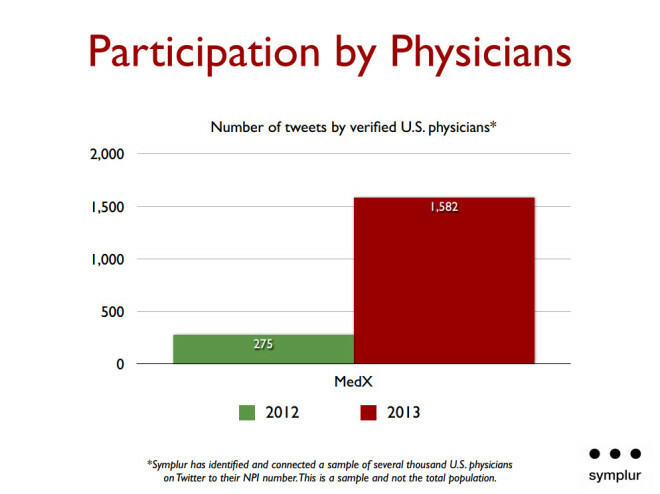 It’s a visual representation of the Twitter conversation surrounding Medicine X 2012. In it, each node represents a Twitter account using the #MedX hashtag during last year’s event. We purposely color coded the known patient Twitter accounts in green. The larger nodes demonstrate those participants who are more central in the conversation, more engaged. And the lines between the nodes show direct lines of communication. One person communicating directly with another. 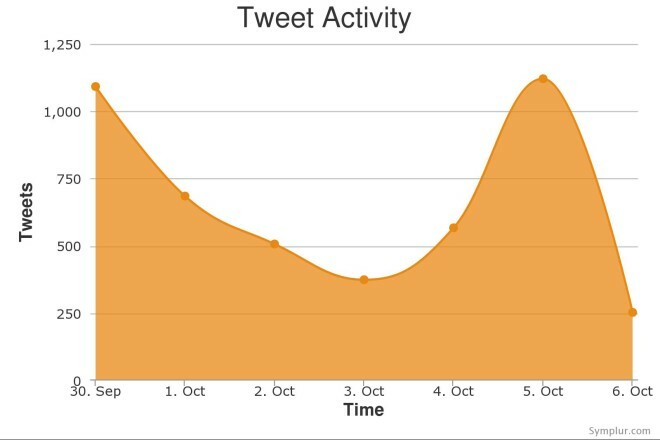 The video plays out over the course of the event, showing each full day in just 14 seconds apiece, and at the end shows the entire conference … displaying the full dynamic of the Twitter conversation that took place. We love seeing how active patient participation has become. There were countless, and I really mean countless, presentations and panels that inspired me, challenged me, and helped me remember why the field of healthcare continues to be the space in which I remain comfortable and committed. Jack Andraka (@jackandraka) a 16 year old high school student who a year earlier developed a new diagnostic test for pancreatic, ovarian, and lung cancer in their earliest stages at a cost of only 3 pennies per test is a testament to our potential. Regina Holiday (@ReginaHolliday) whose combined loss of her husband, ensuing activism, and unrelenting courage forces us, perhaps uncomfortably, to rethink the status quo. And, one of the co-founders of Sun Microsystems, Vinod Khosla’s (@vkhosla) closing keynote, in which he walked us through a visionary’s view of healthcare delivery in the future that gave me the opportunity to ponder what’s possible, and how fluid the healthcare landscape has become. Denise Silber (@health20Paris), owner of Basil Strategies and Organizer of Doctor’s 2.0 & You, Medicine X’s “sister conference” in Europe, traveled from Paris to Palo Alto to participate. Denise’s conference, like Medicine X, involves all stakeholders and provides a stunning experience that focuses on emerging technologies, trends, and the application of social media in healthcare. At Medicine X she shared insights into the many progressive activities taking place across the diverse population of Europe, reminding us that the issues being discussed at this conference are part of a much larger, global movement. Lastly, I’d like to draw attention to Sarah Kucharski (@AfternoonNapper), whose 6 minute “ignite speech” so powerfully addressed the pain and strain experienced in the patient/caregiver relationship. Days later she commented on Twitter that when she looked back at the tweet-stream during her talk that there were no tweets. “It’s as though it never happened”, she stated. As pointed out earlier, we at Symplur are data geeks of the highest order. But even we’ll admit that sometimes standard metrics, stats, and analytics can miss the point. In Sarah’s case the void in the tweet-stream represented something intimate … the vulnerable human in all of us. We stopped tweeting. We let go of our keyboards and touch-screens. And we just listened, related, and cried a few of our own tears, to ourselves. That silence actually spoke volumes. We all have our own #1 take-aways and memories of Medicine X 2013. This was mine. And through it all the energy poured from the conference venue and onto the social web. From there the virtual audience, those from around the globe who were watching the live feed or tweet-stream, chimed in and created a ground-swell of participation, sharing, and debate. Via my iPad I kept logging-on to our analytics tools at Symplur and and would dive into the data as it was unfolding. There … I could see it coming. The #MedX hashtag was on fire, and on the afternoon of Day 1 it began trending on Twitter, at one point becoming the most frequently used hashtag in the U.S. on that day. And that meant the many messages emanating from Medicine X were being shared with an audience that went far beyond the physical walls of the conference. On the afternoon of Day 2 Hayley Goldbach (@hayleysgold) invited me to a quick interview based on all the ruckus caused by Medicine X on Twitter during the previous day. And this trend of social media activity continued throughout the full three days of the conference. 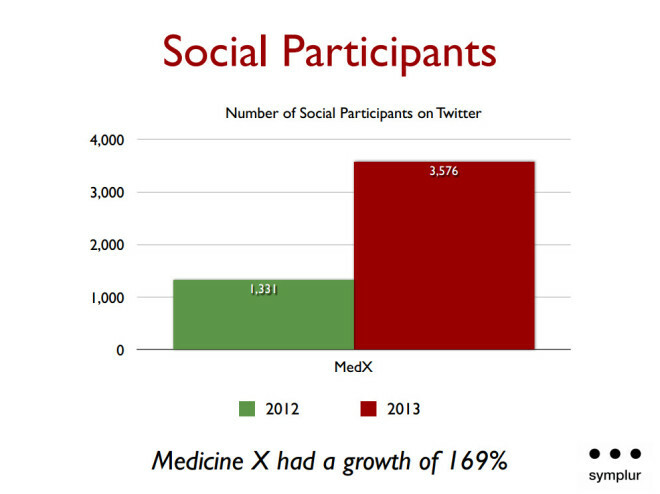 With that in mind, the following graphs represent a smattering of the remarkable year over year growth of Medicine X on Twitter. Some conferences, such as Medicine X, are only physically attended by a few hundred individuals. Others are attended by tens of thousands (#HIMSS13). Some are only single day events, and others last a week. However, having monitored, archived, and analyzed so many conferences over the years, Symplur can accurately compare Medicine X to others. 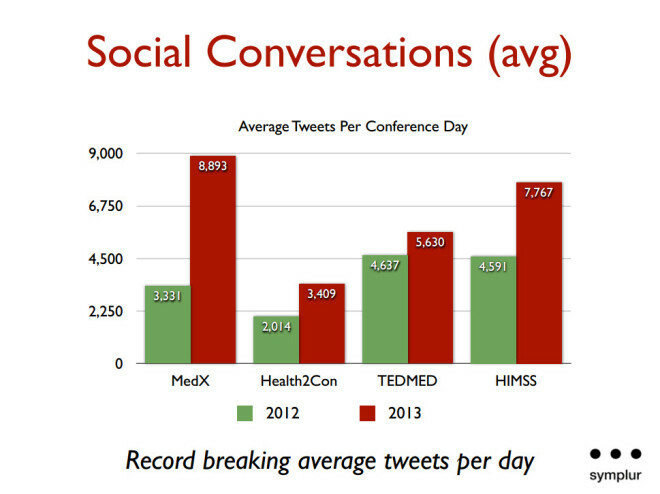 And with that in mind, we can comfortably say that Medicine X set a new world record for the average number of tweets per day at a healthcare conference. The graph below compares Medicine X on this metric to three other amazing and successful healthcare conferences, each powerful in their own right. And that’s when it hit me. I did belong there … as did so many others. Perhaps the most remarkable thing about Medicine X was the atmosphere itself. The fact that so many stakeholders were in the same space, and in the same virtual conversation. A week after Medicine X was in our rear-view-mirror, Audun and I had a phone call with Larry Chu. During that conversation he stated that he just wanted to create the type of conference that he’d like to attend himself. I’ll go on record saying that Dr. Chu’s vision manifested itself in a remarkably diverse environment that confronted and inspired us with many different viewpoints. It challenged our thinking. And it provided the opportunity for opposing points of view to directly enter the discussion, with thought leaders on all fronts. The goal of most healthcare conferences is to instill a sense of commitment among its attendees. To inspire them to continue to contemplate the messages disseminated. And to find ways to integrate some of these new ideas into their own lives and work settings. 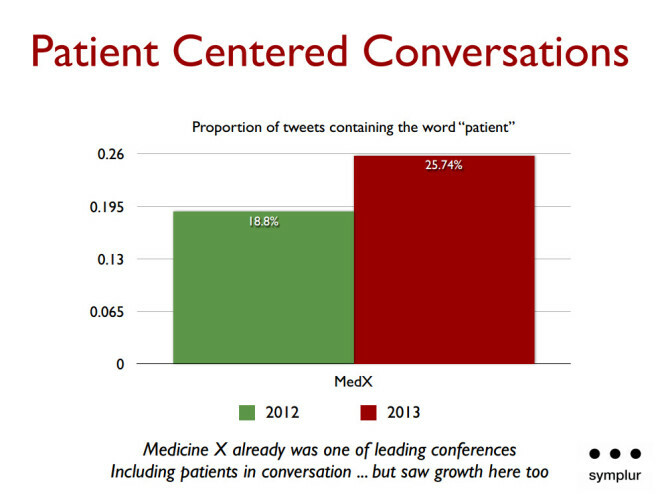 With that in mind, we at Symplur like to look at the “after-conference” discussion on Twitter. Here we can gain a sense of the lasting impression and influence of a given healthcare conference. 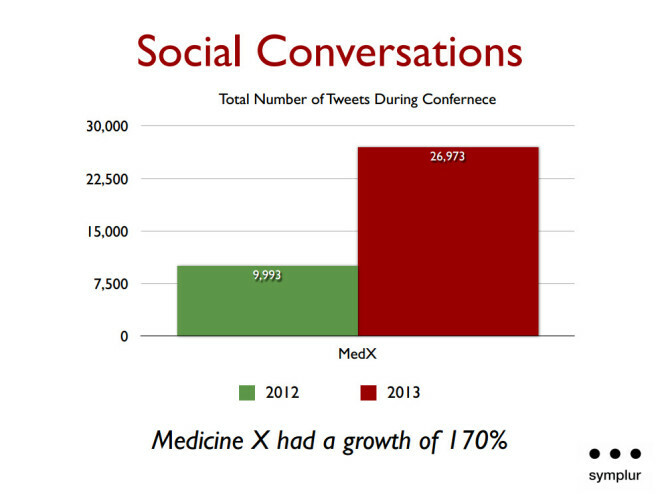 And in the case of Medicine X, it’s again a display of success … with 4,599 tweets using the #MedX hashtag in the 7 days after the conference. As a matter of fact, 1,121 occurred on the sixth day alone. Medicine X. Mark your calendar for next year, because such are the spaces in which the seeds of change are planted. And we should all be thankful that both the sponsors of Medicine X, and Stanford University itself have provided fertile soil for us all.